It is well known that plants take in carbon dioxide and give off oxygen, but in the late 1980s, NASA revealed that many common houseplants scrub other chemicals from indoor air. Some of the most common indoor air pollutants are formaldehyde, benzene and trichloroethylene. These chemicals are released over time from man-made products in our homes. Treated wood, paint, carpet, furniture and cleaning products release these chemicals, which are also called volatile organic chemicals (VOCs). The Boston fern is one of the best plants for removing them from the air. 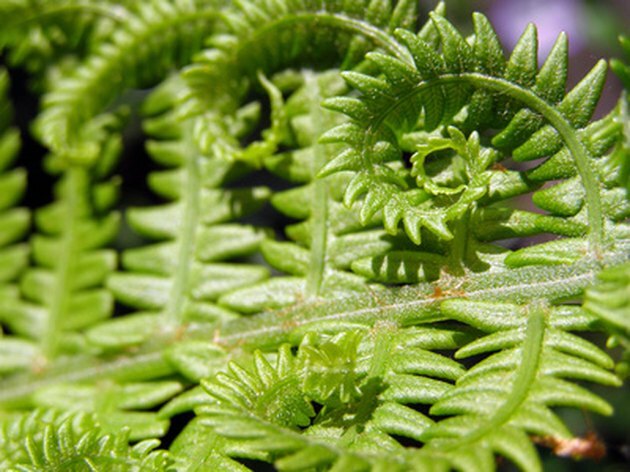 Ferns are efficient cleansers of indoor air. Wolverton Environmental Services explains that plant leaves can absorb chemicals through a process called metabolic breakdown. In other words, the plants eat the chemicals and process them to create energy. The chemicals are broken down into useful entities such as organic acids, sugars and amino acids. Plants pull down oxygen and any other chemicals in the air into their root systems, where all chemicals are processed and released as harmless--and beneficial--water vapor. Microbes are bacteria that live in the root system, or rhizome area, that adapt to the presence of something like formaldehyde by producing more microbes that are resistant to the chemical. The longer the microbes are exposed to the chemical at high concentrations, the more resistant they become to its effects and the more efficient they become at eating it up. A NASA publication explains that, following the energy crisis of the 1970s, homeowners and builders alike became more interested in the benefits of energy-efficient homes. They began to build houses that were more airtight, that would prevent heat from escaping in the winter and prevent hot air from entering in the summer. The problem with this design is that the air inside becomes trapped, along with all the VOCs released by the house and its contents. The air indoors is not exposed to the regenerative effects of the surrounding ecosystem. This is less of a problem in older, drafty homes. However, for the typical 1,800 square-foot house, The University of Minnesota recommends 15 to 18 houseplants in 6- to 8-inch pots. The benefit to filling your house with beautiful--and inexpensive--Boston ferns is clear. There is no easier way to clean the air that you and your family and pets breathe than by using common houseplants as air filtration systems. But do not discount the importance of actual air circulation: Always open doors and windows whenever you can to let out the old, stale air and let in the new. Other benefits include higher oxygen levels indoors, higher humidity, which is especially nice if you live in an arid climate, and even lower stress levels. Boston fern is not the only houseplant that cleans the air. Some other common cleaners are spider plants; palms, such as areca, bamboo and dwarf date palms; as well as other ferns, English ivy, peace lilies, Chinese evergreens and weeping ficus. Is the Lucky Bamboo Plant a Good Clean Air Plant?